Noted: There are 3 questions (24, 25, 26) were updated in 11 March, 2018. What is the definition of bandwidth? What is a role of the Logical Link Control sublayer? What is indicated by the term throughput? What technique is used with UTP cable to help protect against signal interference from crosstalk? Refer to the exhibit. What is wrong with the displayed termination? The woven copper braid should not have been removed. The wrong type of connector is being used. The untwisted length of each wire is too long. The wires are too thick for the connector that is used. Which type of connector does a network interface card use? 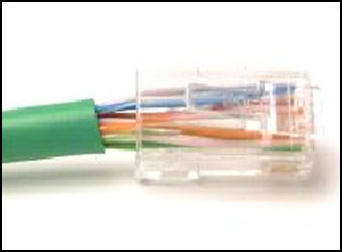 What is one advantage of using fiber optic cabling rather than copper cabling? It is usually cheaper than copper cabling. It is able to be installed around sharp bends. It is easier to terminate and install than copper cabling. It is able to carry signals much farther than copper cabling. Why are two strands of fiber used for a single fiber optic connection? The two strands allow the data to travel for longer distances without degrading. They prevent crosstalk from causing interference on the connection. They increase the speed at which the data can travel. They allow for full-duplex connectivity. Which layer of the OSI model is responsible for specifying the encapsulation method used for specific types of media? It determines the path to forward packets. It accepts Layer 3 packets and encapsulates them into frames. It provides media access control and performs error detection. It monitors the Layer 2 communication by building a MAC address table. What is true concerning physical and logical topologies? Physical topologies display the IP addressing scheme of each network. Logical topologies refer to how a network transfers data between devices. Which method of data transfer allows information to be sent and received at the same time? Which statement describes an extended star topology? End devices connect to a central intermediate device, which in turn connects to other central intermediate devices. End devices are connected together by a bus and each bus connects to a central intermediate device. Each end system is connected to its respective neighbor via an intermediate device. All end and intermediate devices are connected in a chain to each other. What is contained in the trailer of a data-link frame? The transmitting node inserts start and stop bits into the frame. The transmitting node sends a beacon to notify that a data frame is attached. The receiving node identifies the beginning of a frame by seeing a physical address. The transmitting node sends an out-of-band signal to the receiver about the beginning of the frame. What is the function of the CRC value that is found in the FCS field of a frame? The term bandwidth indicates the capacity of a medium to carry data and it is typically measured in kilobits per second (kb/s) or megabits per second (Mb/s). A physical topology that is a variation or combination of a point-to-point, hub and spoke, or mesh topology is commonly known as a hybrid topology.